Eclipse on an ASUS Eee PC? Update: I’ve posted my experiences and some tips on using Eclipse on my Eee PC 901 in Using Eclipse on an Asus Eee PC. The Eee PC is a a cool, new, subnotebook manufactured by ASUS. The Eee PC 700 series sports a 7″ LCD, a solid state disk and weighs less than 1 kg (approximately 2 pounds). All of these come at a price of less than $500. The thought that came to my mind was, “wouldn’t it be awesome to get a subnotebook to run Eclipse and develop Java applications on the go?” So, let’s examine how feasible this is. 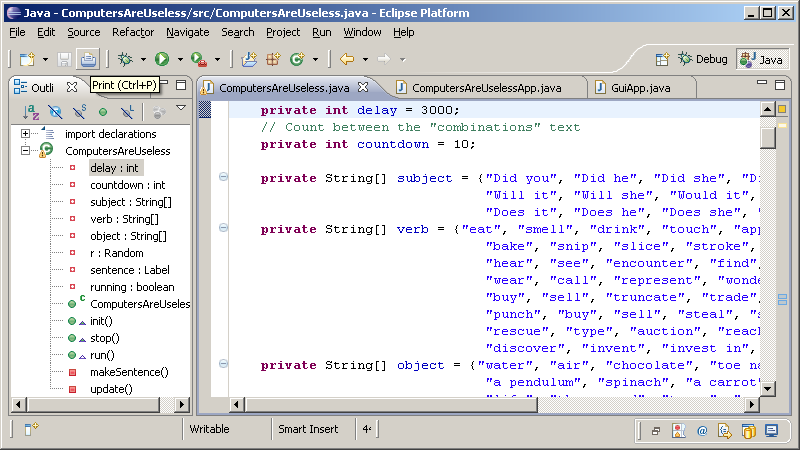 There are a couple of concerns that I have with running Eclipse on the Eee PC in order to do Java development. First, would the small Eee PC be able to handle the Eclipse IDE, which by no means is a small development environment? Second, would the small 7″ screen with a 800 x 480 resolution be sufficient to display the feature rich environment? Third, would the keyboard be good enough in terms of quality and size in order to type code? First, does the Eee PC have enough processing power to run the Eclipse IDE? Just as a reference, when I fire it up on a Windows XP laptop, it usually takes about 15-20 seconds to load and consumes around 100 MB of memory. (Right now, it has 128 MB allocated, sitting in the background as I type this post.) Would a small machine with a Celeron-M processor running at 630 MHz be able to handle the heavy-weight Eclipse development environment? In terms of the system memory, the Eee PC 700 series can be expanded to 2 GB, so that is not a particular concern when I am (arguably) comfortably on this system which only has 768 MB of RAM. Also, the Eee PC uses a solid state drive, or SSD, which is basically a cluster of flash memory in a ATA interface drive enclosure, instead of a hard drive, so the read performance is probably better than a laptop hard drive spinning at 4200 rpm. Second concern is the screen. Considering the size of the screen is only 7″ and the resolution is 800 x 480, which by today’s standard is quite small, would the Eclipse IDE have enough screen real estate to be usable? In order to find out, I’ve simulated what Eclipse looks like when it is sized in 800 x 480. To the right is a simulation of how Eclipse may look on a screen resolution of 800 x 480. Since I can’t resize the desktop on this machine to 800 x 480, I resized Eclipse to 800 x 450. (The taskbar takes up 30 pixels in Classic mode.) I did remove some of the tabs and tool bars to allow maximum space for displaying the source code and the outlines on the left. It seems like using Eclipse would be manageable under these conditions. It appears that about 17 lines can be displayed at once, so it’s definitely less than one would have seen in a text-mode DOS terminal, but definitely tolerable. To get a better idea of getting Eclipse to run on the Eee PC, I did a quick Google search and that brought up a few other people who have tried it already. In fact, one person has a YouTube video of running Eclipse on the Eee PC running Linux. Watching the video, it seems like it’s quite possible to run Eclipse. The third and final issue is the keyboard. As with any small computer keyboard, the small keys can be difficult to type on. When I stopped by a computer store which had an actual unit on display, the keyboard did feel a little bit on the small side, but as with any new keyboard, it would probably become more comfortable to use after getting used to using it. In all, the ASUS Eee PC seems like a nice little notebook to do some Java development using Eclipse, but it’s still probably a little bit on the small side to do any serious, prolonged work. I’ll probably go ahead and wait for the newer 900 series model with the 8.9 inch display. This entry was posted on Monday, May 19th, 2008 at 8:17 pm	and is filed under Development. You can follow any responses to this entry through the RSS 2.0 feed. Both comments and pings are currently closed.